Our goal is to help you raise more money in less time. Order 50 or more cases ($1,500 or more) to receive a 50% profit. Order less than 50 cases ($1,499 or less) to receive a 40% profit. Profit excludes freight and applicable taxes. No startup costs means that your fundraising program can start running as soon as possible. Public and Catholic schools are automatically pre-approved for credit. Other creditworthy schools, organizations, and individuals can also receive credit by submitting a Credit Application. 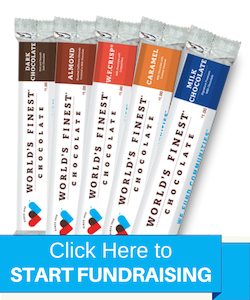 One of the things that makes fundraising with World's Finest® Chocolate so unique is the level of service and attention we provide to our customers. This is accomplished through our dedicated Fundraising Specialists, an elite team of World's Finest® Chocolate experts located throughout the country. They keep up with the latest and greatest fundraising ideas, trends, and preferences in order to ensure success. It's much easier to sell products that people actually want to buy. Our products are made of premium quality chocolate and affordably priced at $1- $2. In fact, they're so delicious that people will keep buying it over and over again. World's Finest® Chocolate has a strong brand reputation and it's not sold in stores, so your supporters know they are getting something special. We partnered up with Three Winners, a coupon website that has endless amounts of discounts in your area (more than 40,000 discounts nationwide). On the back of every bar, there's an activation code for the Three Winners' website, which lasts 90 days. If your first order with us meets certain requirements, we will provide free chocolate to pay for your prize program (up to $1,800). The better the prize program, the more motivated the sellers will be. Customers that sell at least 335 cases ($10,000 or more) can qualify to receive sell-out bonuses. Upon selling all of your chocolate (no returns) and paying your invoice in full within 45 days, we'll send a bonus check to thank you for your business. World's Finest® Chocolate also provides a hands-on learning experience.Talking to potential customers, persuading them to buy, and handling money helps sellers gain valuable life skills. Children, in particular, may gain confidence, improve communication skills, learn about personal responsibility, and practice their math and financial skills - with each and every sale.